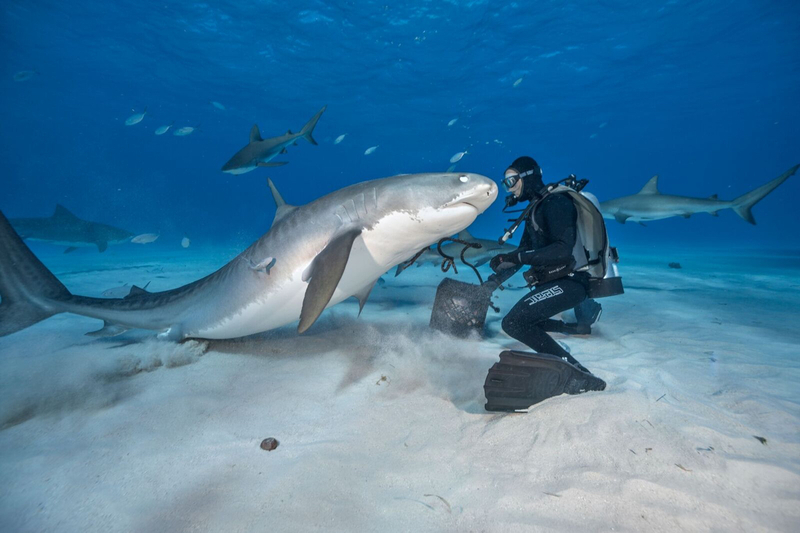 The Milford native and National Geographic photojournalist has spent his life up close with sharks and their fragile environment. We should listen to him. 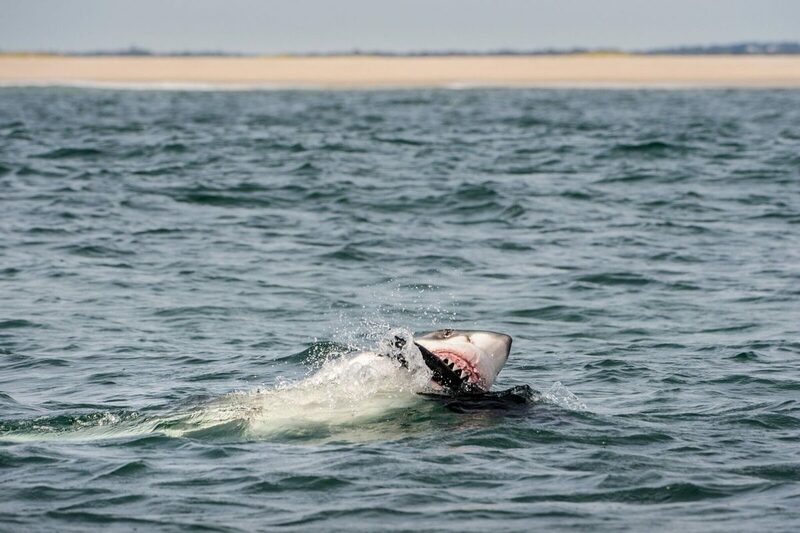 By Spencer Buell·	 6/11/2017, 6:02 a.m.
Flip through Milford native Brian Skerry’s upcoming book of shark pictures, Shark, and you’ll see dozens of breathtaking images: an Australian Great White smashing its huge body through the ocean’s surface with its jaws agape; a whale shark wrapped in a cyclone of smaller scad fish in the Gulf of Mexico; and a sand tiger shark baring its dozens of teeth off the Japanese coast. Skerry gets his camera mere inches away from his subjects to produce some of the most intimate portraits of the fearsome and fascinating creatures you’ll ever see. But read Shark to the end, and it’s the last few pictures that will stick in your mind. In one taken in Montauk, young sport fishermen grin next to a juvenile shark caught and killed at a competition. In another, a shark dangles underwater trapped in a commercial fishing net. Then there’s the image of a dozen or so blood-soaked mako sharks flopped on a beach, their dorsal fins lopped off for soup. Those shots tell the horrific story of what’s happening to sharks every day, and it’s a story that has haunted Skerry for much of his career. It’s an animal that has been sculpted by nature to be absolutely exquisite. It’s a perfect blend of grace and power. But as Skerry knows all too well, everything is not OK. Each year, an estimated 100 million sharks are fished and killed, in some cases nearly to extinction, often just to harvest their fins for tasteless yet coveted shark fin soup. Meanwhile, ocean acidification, which occurs when the ocean’s chemical makeup changes along with greater levels of carbon dioxide in the atmosphere, is bleaching coral reefs and disrupting shark behavior around the world. And Skerry, who has spent more than 10,000 hours underwater over 40 years, has watched and recorded this slow decline, month after month, year after year. 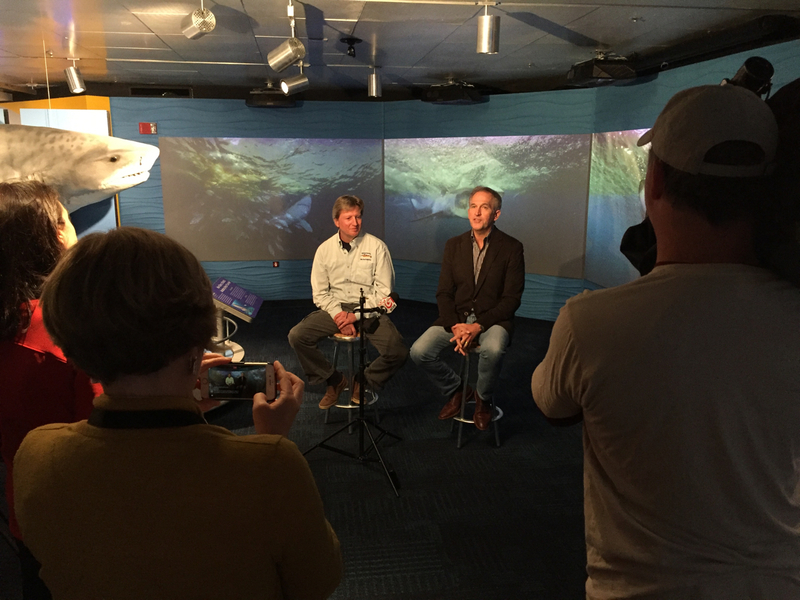 I first get to see Skerry in his role as ocean evangelist on a drizzly Thursday morning in May at the New England Aquarium, where he is the “explorer in residence,” and an exhibit called “Science of Sharks” is now on view. Seated on stools, he and marine biologist Greg Skomal pose for pictures and field questions from a handful of reporters. The room is teeming with shark stuff—there’s a tank full of tiny shark species; a handful of incubating epaulette shark eggs; digital displays with information about what makes the animals tick; and a trio of screens on which a highlight reel of Skerry’s work plays on a loop. Skerry looks at home and is gushing about sharks. Not too long ago, the word “shark” conjured images of the monstrous fictional creature from Jaws. But that’s changing. There is greater awareness of conservation issues now, Skerry says, and people have come to respect the animal rather than fear it. Sharks have also gotten some good PR as of late. Recently, after long-term preservation efforts like banning seal-hunting have caused shark numbers to rebound off the coast, “everything exploded in terms of media and attention,” says Skomal, the state’s top expert on sharks and one of Skerry’s longtime scientific collaborators. 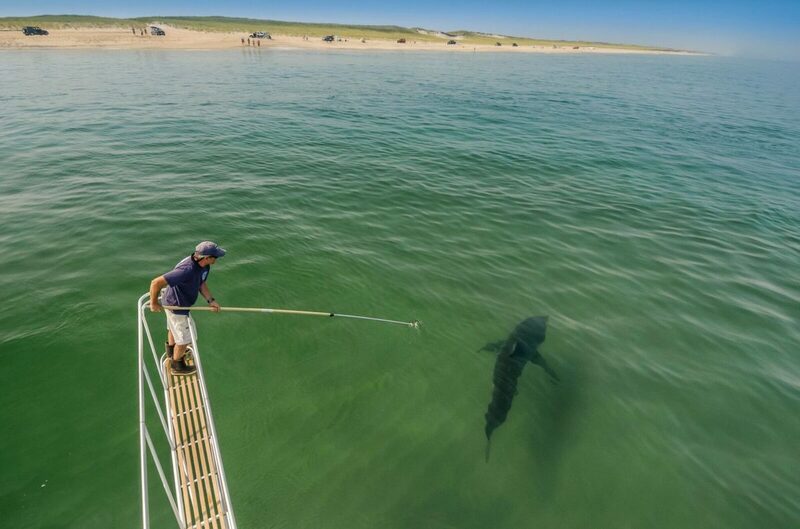 Media-savvy advocacy groups like Cape Cod’s Atlantic White Shark Conservancy, national TV programming like the Discovery Channel’s Shark Week, and the ascendance of social media icons like Mary Lee have helped make shark conservation part of pop culture. It’s not only families at the aquarium and extreme fishing hobbyists that Skerry needs to convince to take the ocean seriously. He has a set of policy prescriptions to help preserve marine life that he’d like to see enacted. He believes we need a massive expansion of marine protected areas—we should be protecting 30 percent of the ocean, he says, but we’ve only protected about 3 percent worldwide. We also need tougher restrictions on the global commercial fishing industry, he says, and we need to rein in the damaging effects of pollution and climate change. 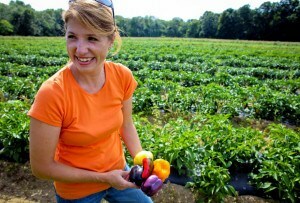 But with the current occupants of the White House, it’s an uphill battle. Consider that over the past six months President Trump has proposed deep cuts to the Environmental Protection Agency, appointed a climate change skeptic to helm it, and pushed for rolling back regulations and re-negotiating water cleanup efforts. He also pulled the U.S. out of the Paris climate accord, and moved to green-light oil exploration in the Atlantic Ocean—including plans to OK a new method called seismic testing, which emits a deafening sound at the ocean’s floor that disrupts marine life for thousands of miles. Trump’s approach to conservation is a sharp deviation from President Obama’s. 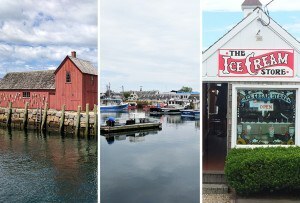 Even if conservationists couldn’t get their all of their goals achieved under the former president, he protected more of the ocean than any president before him and established the first-ever marine national park in the Atlantic Ocean, an area the size of Connecticut off the Cape Cod coast. 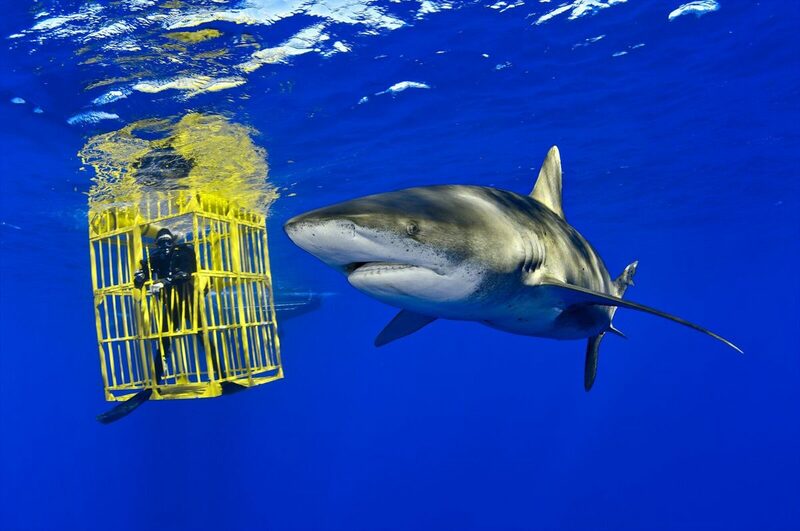 Obama has said he’s a fan of Skerry’s work, and during the then-president’s trip last summer to his home state of Hawaii, he invited Skerry to join him for a dive. That’s where Skerry famously shot the only underwater photo of a sitting American president. 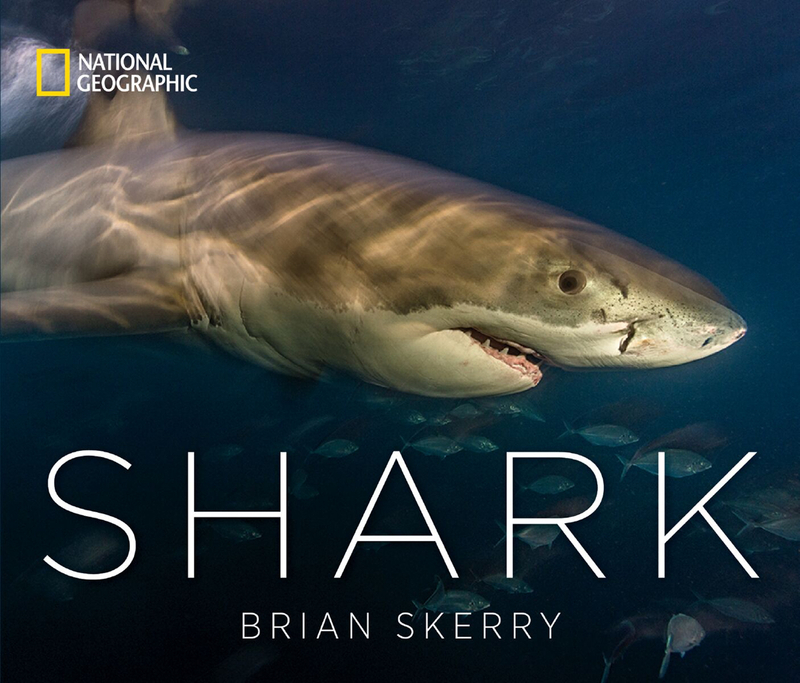 Brian Skerry’s new book, Shark, comes out June 13.